Boldy James: Boldy James' first big break on the national scene came in the form of two features on The Cool Kids and Don Cannon 2009 mixtape Merry Christmas, on the songs “BBQ Wings” and ”Tires”. On October 15, 2013, he released his debut album, My 1st Chemistry Set entirely produced by The Alchemist. On May 22, 2014, it was announced that Boldy James, Bishop Nehru, and Fashawn were the first signees to Nas' Mass Appeal Records. M. Stacks: M. Stacks (DJ/Producer) is becoming one of Hip-Hop’s rising talents. From producing songs for some of the industry’s finest to deejaying at some of the best nightclubs in America, he has built a solid track record. M. Stacks has laced tracks for artists ranging from Bun-B to Machine Gun Kelly. Avante-Tarde: A Minneapolis based garage rock outfit that cant decide if they want to be a psychedelic noise rock post punk band or actually good at their instruments... but always a treat to see live. Denim Matriarch: A group of young, prodigy musicians. Their in a unique music genre which people like to call Progressive Psychedelic Space Blues Rock Fusion. Sol: A Minneapolis instrumental prog rock band changing between melodic jazz progressions and heavy riffs. So underground they dont even have a soundcloud. Nashville and Atlanta's #1 Rock and Soul Dance Party. 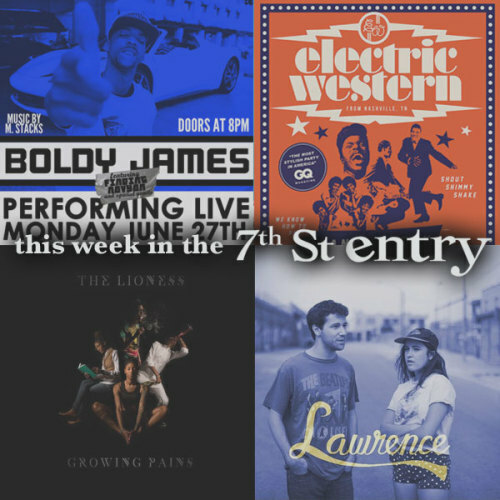 Famous in Nashville simply as "The Monday Night Dance Party," ELECTRIC WESTERN presides over their wildly successful weekly rock and soul dance party, now in its eighth year. DJs JACOB JONES and RENO BO spin a hand-selected mix of the most danceable popular and obscure 50's and 60's Rock and Roll, Soul, Doo Wop, Girl Groups and Garage Rock every Monday night in Nashville and once a month in Atlanta. They will now be hosting this event in Minneapolis! The Lioness, born Shaiwna Adams on April 6, 1988 is the youngest of a large family from Minneapolis. Shaiwna’s first mixtape, The Most Anticipated, released in January of 2011, debuted just months after graduating from McNally Smith College of Music in St. Paul. Ambitious as ever, she returned to work simultaneously on her third mixtape, Queen. Followed by a collaboration project with Titan Administration Records on the release of The Cabinet compilation, both released in 2013. The Lioness still resides in North Minneapolis, and is currently working on her first full-length solo album, tentatively slotted for release in the Spring of 2016. Fort Wilson Riot: Splitting their time between unstoppable touring and incessant recording, the Minneapolis-based duo of Amy Hager and Jacob Mullis have no shortness of ambition. In their time as a band they have recorded an indie-rock opera, Idigaragua, and performed it with a full cast of actors and dancers, produced and recorded their full length follow-up, Predator/Prey, and dropped singles, remixes and compilations. Pornonono: Pornonono is an RnB future-myth in search of a time and place we can all dance ourselves into one body and soul. Aaron Baum, Amy Hager, Jacob Mullis, Jared Isabella, Ben Clark. The Hell & The Quiet: The Hell And The Quiet is a four piece that delivers straight up rock 'n roll and good times. The band is comprised of Ashley Daniels (vocals/bass), Megan Peterson (vocals/guitar), Andy Peterson (drums) and Brian Lambert (vocals/guitar). Formed in the blistery winter of 2014, the band has released one EP to positive reviews and is about to release their second on July 2, 2016 with a release party (and wedding party for Ashley) at the 7th St Entry. The Pleasure Programme: The Pleasure Programme is a rock band based in Minneapolis. The band plays a loose and fun live show with a good balance of fast and slow, loud and soft, acoustic and electric. Singer/songwriter Jesse Daniels leads the band with Austin, MN native David Smith on drums, the towering J.C. Warfield on bass, artist-extraordinaire Mike Carina on keyboards and pro-jammer Matthew Ogden on lead guitar. They are currently preparing their debut album.